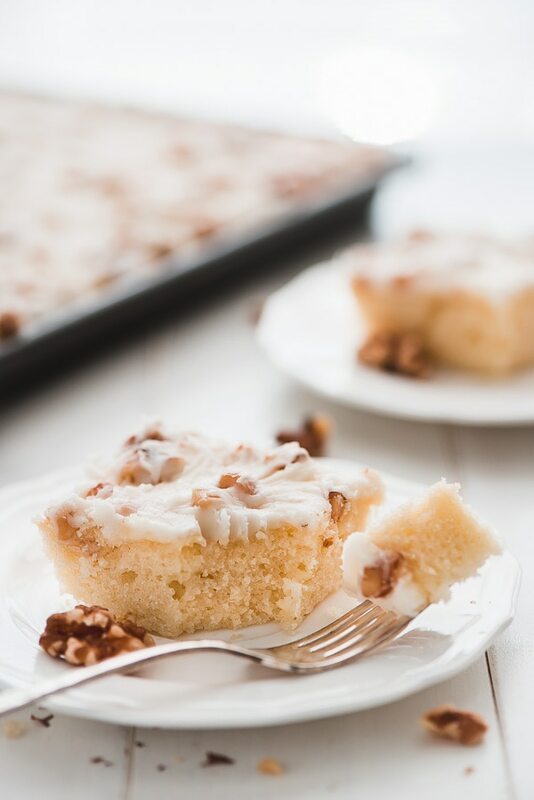 White Texas Sheet Cake is a light and fluffy white cake topped with a sweet, buttery frosting that is loaded with toasted walnuts. 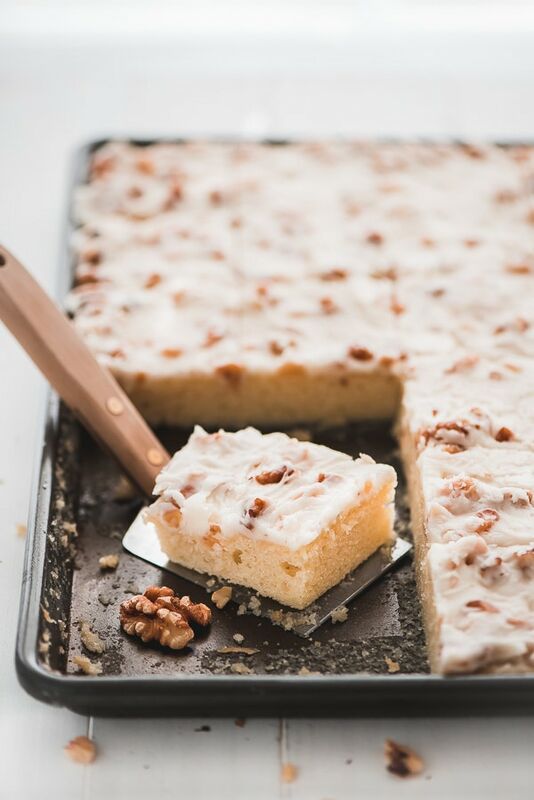 Making a layer cake can be a little intimidating and does take quite a bit of time to make, bake, and decorate but this White Texas Sheet Cake is a piece of cake! Seriously. Absolutely no decorating skills or special equipment are needed. You just need a pan, mixing bowls, and a sauce pan. Plus, this baby feeds 24 people and it’s way easier to slice up than layered cake, not to mention, it keeps the portions to a more realistic size. 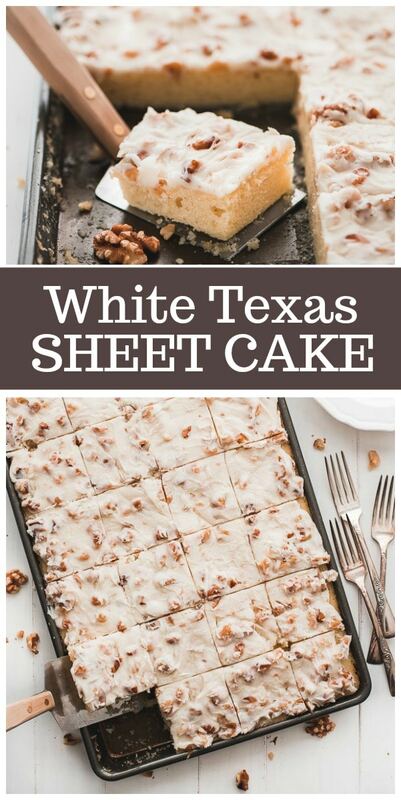 It’s so easy to make a White Texas Sheet Cake! 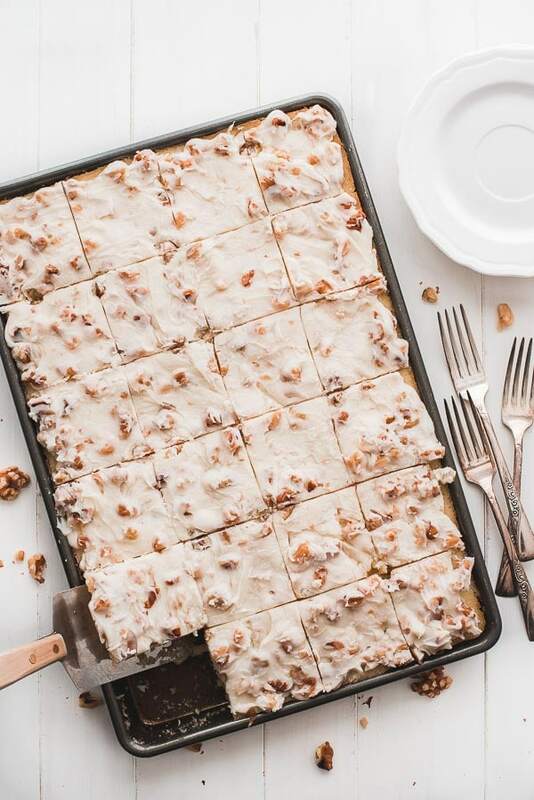 You’ll start with toasting the walnuts that go into the frosting. Toasting the nuts brings out their nutty flavor and give them a nice crunchy texture. All you have to do is toss them onto a pan and bake them for 5 to 7 minutes at 350 degrees F. If you like adding nuts to your salads, go ahead and throw in some extra to keep on hand. Next, you’ll prepare the pan for the cake. Just spray a 15x10x1 inch pan with cooking spray. You can use a 17×13 inch pan, but the cake will be slightly thinner and you’ll want to begin to checking if it’s done at 18 minutes. To make the batter, place butter and water in a pot and heat it to a boil. 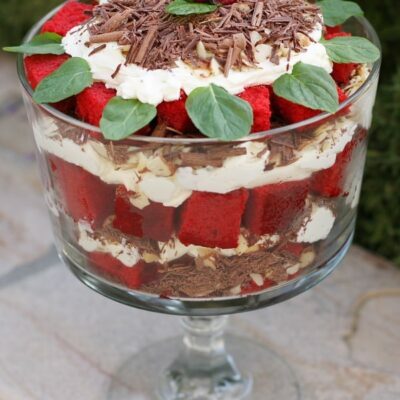 While you’re waiting, measure all the dry ingredients together into a large mixing bowl and the eggs, sour cream, and extract in a small mixing bowl. Once the butter and water come to a boil you’ll mix them in with the dry ingredients followed by the egg mixture. Then just pour it in to the pan and spread the batter evenly across the pan. 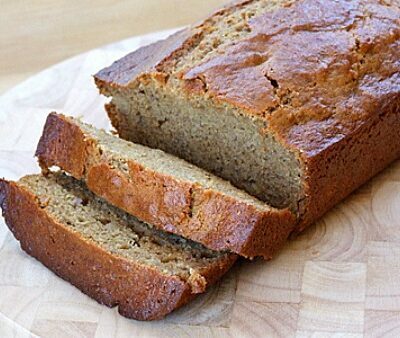 Since this cake is thin, you only have to bake it for around 20 minutes. What’s different about this cake is that you frost it when it’s still warm. After you pull the cake out of the oven, you begin to make the frosting by melting butter in a pan with some milk. Once it’s melted and starts to boil you take it off the heat and add in the sugar and extract. Once smooth, stir in the toasted walnuts, pour it over the warm cake and spread it in an even layer. It’s hard to resist but let it cool completely and then slice it up. Enjoy! 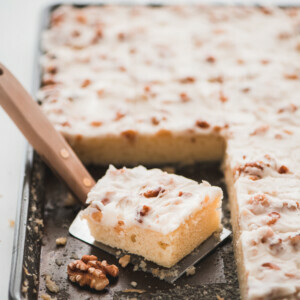 Here's a classic recipe for White Texas Sheet Cake with Boiled White Frosting and added walnuts! 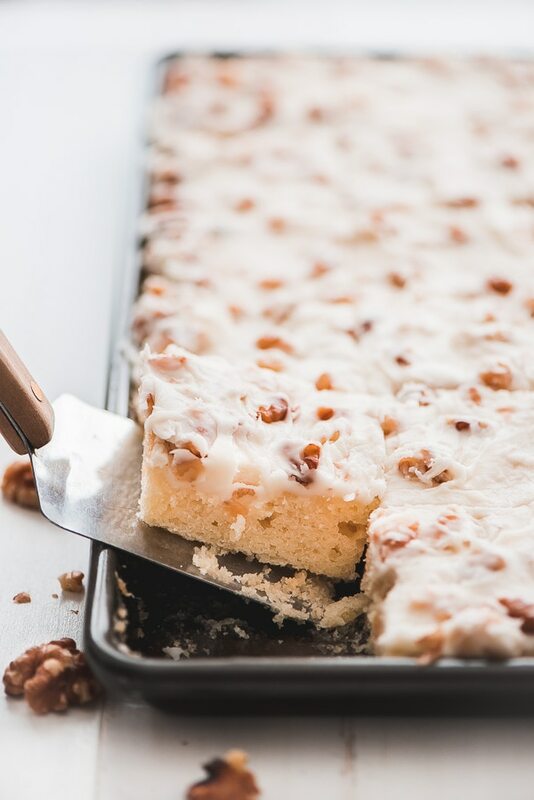 Preheat oven to 350 degrees F. Place the walnuts (from the frosting ingredients) on a baking sheet and bake for 5 to 7 minutes, until toasted and fragrant. Set aside and let cool. In a large mixing bowl, whisk together the flour, sugar, baking powder, salt, and baking soda. Set aside. In a small mixing bowl, beat the eggs, sour cream, and vanilla extract together. Set aside. In a small pot, bring butter and water to a boil, remove and stir into the dry ingredients. (Don't wash the pan! You'll use it for the frosting.) Add in the egg mixture and stir until combined. Spread the batter into the prepared pan and bake for 20 to 22 minutes or until toothpick comes out clean. Set the cake aside to cool slightly while preparing the frosting. In a medium saucepan, bring the butter and milk to a boil. Remove from heat and whisk in the extract and the powdered sugar 1 cup at a time until smooth. Stir in the toasted walnuts. Pour over the cake and spread evenly. Let cool, slice, and serve. *If you use a (larger) 17x13x1 inch baking sheet, just begin to check if it is done starting at 18 minutes. Just made this cake this morning. It’s delicious!!!!!!!!!!!!!! Only thing I did was change from walnuts to pecans.